Involtini is an Italian word which means stuffed and rolled. 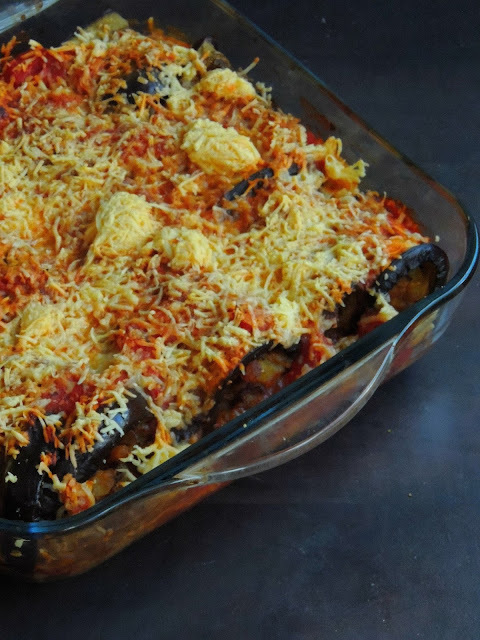 My today' post is a delicious eggplant based Italian dish which is called Eggplant Involtini. Usually eggplant slices are stuffed with cheese and ham or any other meat makes this dish, but mine is a vegetarian version. Stuffed with mashed potato, cheese and roughly chopped almonds, this ultimate Eggplant involtini makes a super filling lunch or dinner to enjoy with your favourite salad or with some toasted bread slices. Eggplant is a wonderful vegetable which is quite an alternative to meat in most of the Italian dishes as this vegetable have somewat meaty texture. And this dish is going to this month's Shhh Cooking Secretly event started by me, which is now hosted by Mayuri Patel. Amish cuisine is a part of Ohio and Pennsylvania states of America, and their traditional cuisine involves their home grown foods. 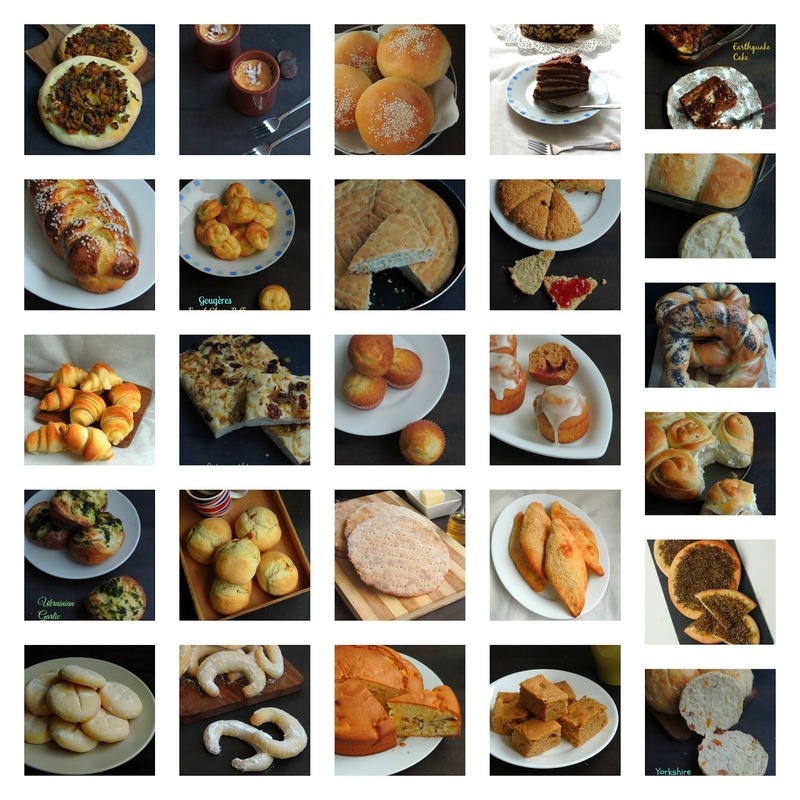 Amish bake many varieties of baked goodies such as pie,cookies, cakes and also breads. Amish Dinner rolls are very popular as they are served in most of the Amish restaurants. These dinner rolls came out extremely fluffy, super puffy and soft. This dinner rolls calls for mashed potatoes, which gives the softness to this dinner rolls. I really loved this dinner rolls as they were extremely soft and super spongy than you can imagine and trust me these rolls are just prefect to make some ultimate sandwiches out of it. 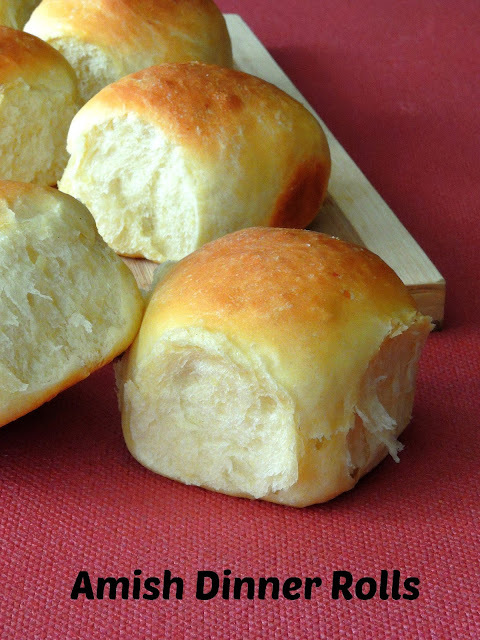 I have bookmarked this recipe from King Arthur Flour long back while i was searching for an easy breezy dinner rolls, and this dinner rolls caught my eyes immediately. Indo chinese dishes are always H's favourite, and i will make sure to dish out an Indo chinese dish atleast once a week from this cuisine. Indo chinese cuisine are very much known for their adapatation of cooking style depending upon Indian taste with chinese seasoning. And most of the Indo chinese dishes are seriously very quick to prepare with a different cooking process. 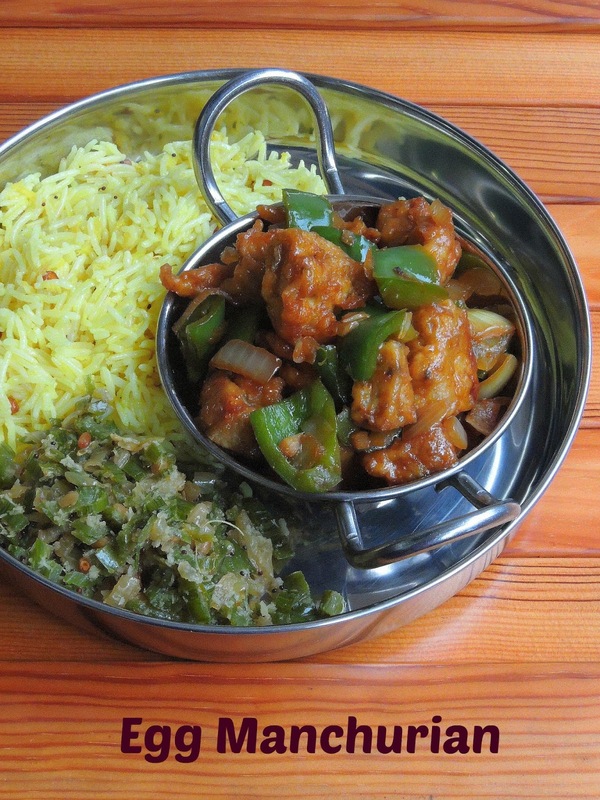 Though Hakka noodles and fried rice from this cuisine is my favourite, kids and H love Indo chinese style manchurian. I have already dished out couple of manchurians with different ingredients, eventhough my today's recipe is quite a different one from the usual one. Egg lovers will definitely enjoy thoroughly this different version of egg manchurian, you might have noticed that my today's post is Version 2. Yes i have already posted my version of Egg manchurian, do check here for my version which calls for hard boiled eggs. 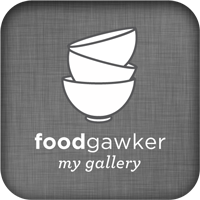 This week's posts are going to be Bookmarked recipes. My bookmark list is overflowing, seriously i want cook or bake all those incredible dishes one by one to finish my list. But am sure its definitely a hard task to finish and close the list, however i dished out three of those bookmarked recipes as am running this week's blogging marathon with 'Bookmarked Recipes' as theme. I have bookmarked this delicious Thor from Jagruti's Space long back, to be honest a year back. I have been looking for a chance to dish out this incredible sweet and finally i prepared them at home. Thor ressembles almost between South Indian Badusha and North Indian Balushahi but with a simple preparation method. Single serving cheesecake are always welcome if you are planning for a get together, And my today's post is definitely an incredible mini cheesecake baked with homemade dulce de leche. Dulce de leche, i just love the flavor of this incredible spread, and preparing dulce de leche at home is definitely a tricky job but yet an easiest one. With a can of condensed milk and a pressure cooker is just enough to prepare your own dose of dulce de leche. 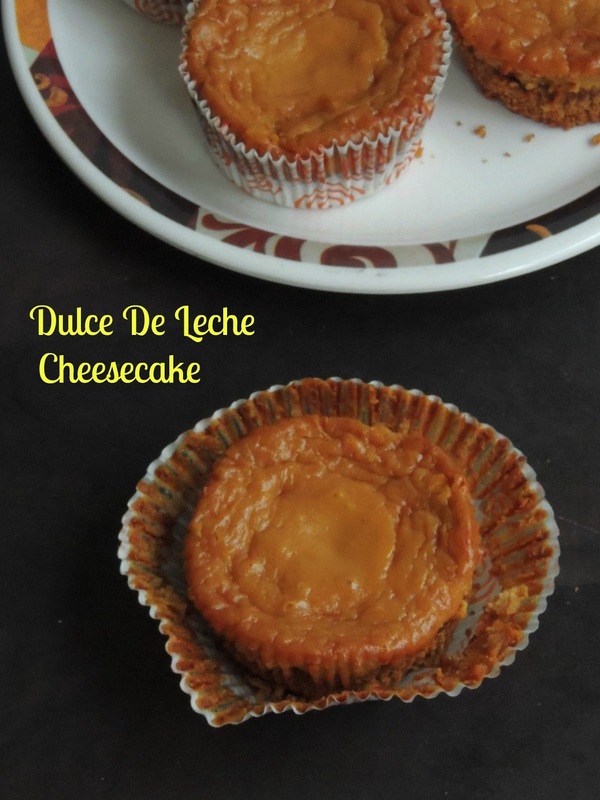 I have already made many versions of cheesecakes but dulce de leche cheesecake was in my to do list since a long. Finally i baked some Mini dulce de leche cheesecake as i picked I love you Love you Cheesecake as theme. Once i picked this theme, my first choice was Dulce de leche cheesecakes. 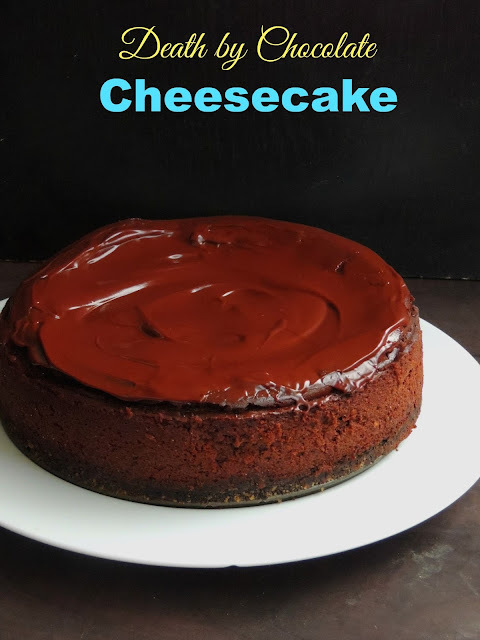 Death by Chocolate Cheesecake, this recipe name itself says everything. This cheesecake is definitely an irresistible, richest, most chocolatey and seriously a real feast for chocoholic persons. This is one of most favourite cheesecake you should never fail to bake atleast once in your life. Loaded with oreo biscuits, followed with chocolate cheesecake, this ultimate cheese cake is topped finally with a chocolate ganache. Obviously a double bonanza for whoever love to enjoy their chocolate loaded dessert will definitely fell in love at the first sight. You might have noticed that am posting delectable and absolutely sinful cheesecakes during this week. As i picked I love you love you cheesecake as theme for this week's blogging marathon, obviously i couldnt resist to post this delicious cheesecake. Cheesecake, i have some huge fans of Cheesecake at home. Obviously if i plan for a cheesecake, i usually start gathering the ingredients immediately than searching for a cheesecake recipe. Yes i may sound funny, coz i always do groceries only on saturday. If i dont get the ingredients on saturday than i cant cook during the weekends, as i can able to cook for blogging only during weekends. I may cook 6-7 dishes or else 2-3 desserts depending upon my themes i usually pick for the blogging marathon only on weekends. When i picked 'I love you love Cheesecake' as theme, i decided to go with a no bake cheesecake, and two baked cheesecakes. When my kids loves baked cheesecakes, my favourite is always no bake cheesecakes. 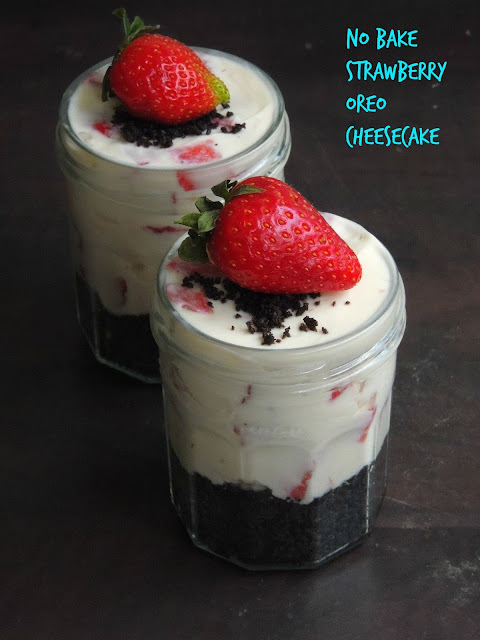 And this time, i dished out this alluring No bake strawberry oreo cheesecake, as this cheesecake calls for oreo biscuits and obviously strawberries. Badam means Almonds, this nuts are very rich source of many nutrients, though they are rich in fat, they can be eaten raw. Indian cuisine are loaded with many almond based ultimate dishes. And my today's post is definitely an another tremendous sweet treat which you should surely give a try yourself at home to please your sweet tooth.These badam puri is one of my family's favourite which my grandma never fail to prepare during Diwali festivals. Easy to prepare, this sweet badam puri calls for simple ingredients. 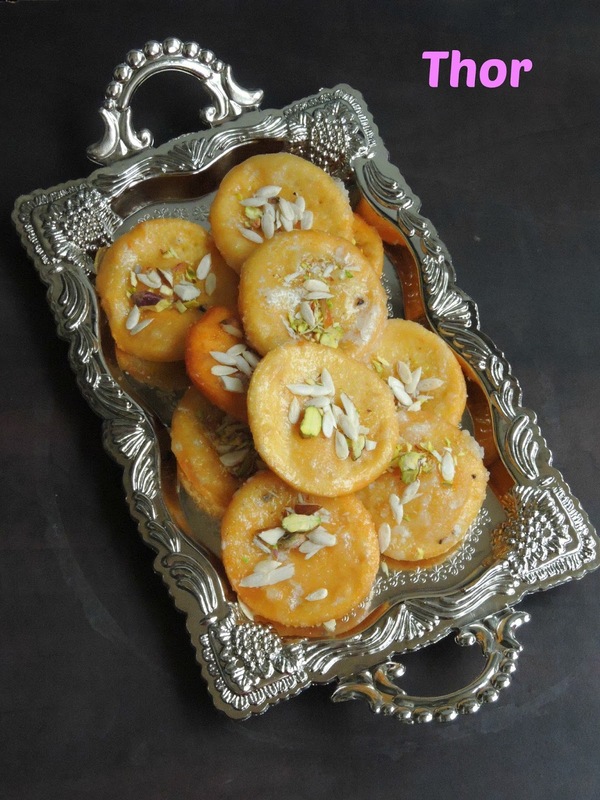 Almond paste is added to maida, rice flour to form a soft dough, hence this sweet dish is called Badam puris. 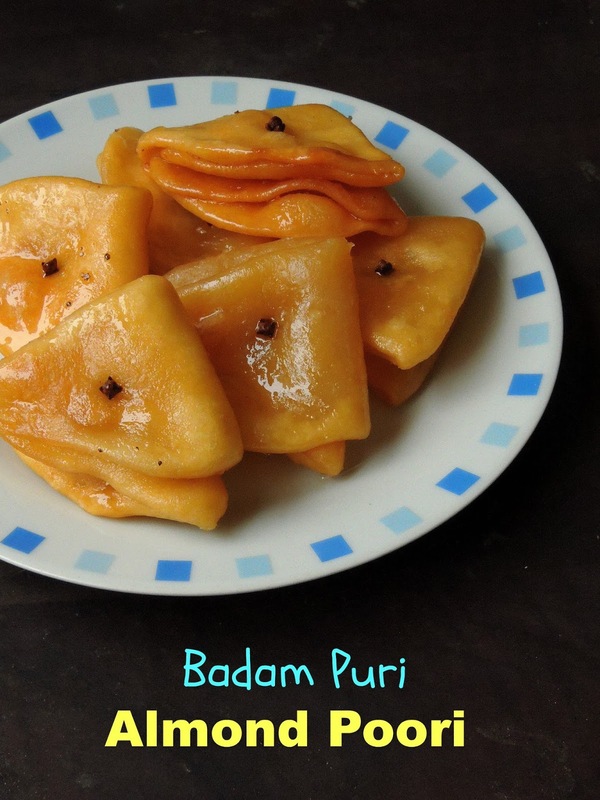 These triangular puris fried in medium flame drenched in sugar syrup makes this ultimate Badam puri. Paruppu Urundai Rasam, is quite a popular and very traditional South Indian recipes which have its own place especially in Tamil Nadu homes. This dish is a super protein rich nutritious Indian style soup to enjoy thoroughly with hot piping rice served along with some spiced roasts or fryums. 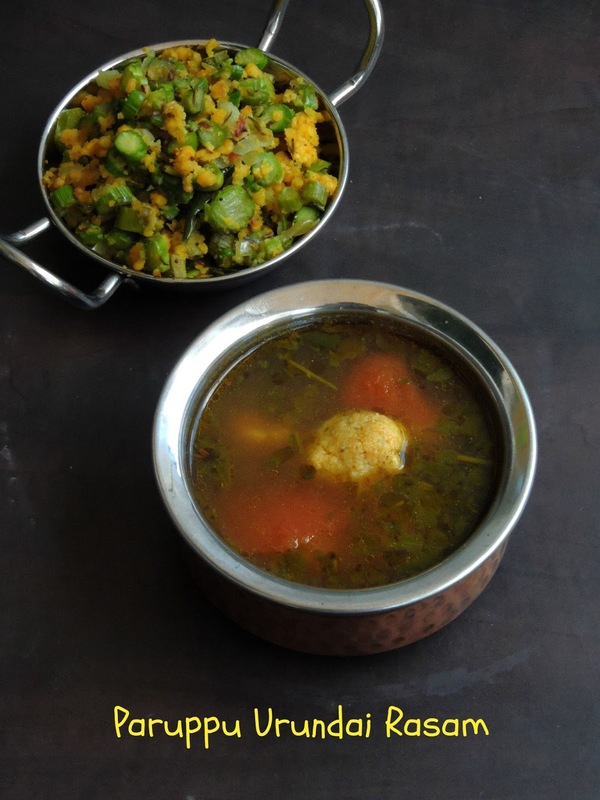 If you are preparing this rasam, you have to get ready first with the lentil balls aka paruppu urundais. Usually these dumplings are prepared with toor dal, but my mom prepares her lentil dumplings with both toordal and channa dal. And her way of preparing this rasam is bit different from the usual one, she just drop the lentil dumplings directly to the boiling rasam. If you dont feel like dropping the dumplings directly to the rasam, just steam cook them and add them. However i follow always my mom's recipe and this paruppu urundai rasam tastes absolutely flavorsome and delicious, and this is my elder son's favourite. He love this nutritious rasam very much with spicy potato toast. My family have many Authentic dishes, born as a Pondicherrian, both my maternal and paternal grandma's have their own traditional dishes. My paternal grandma's recipe book is a real treasure and one of her signature dish is Paal poli. Later my mom makes this ultimate sweet for us as after school snacks, obviously its her favourite as well. 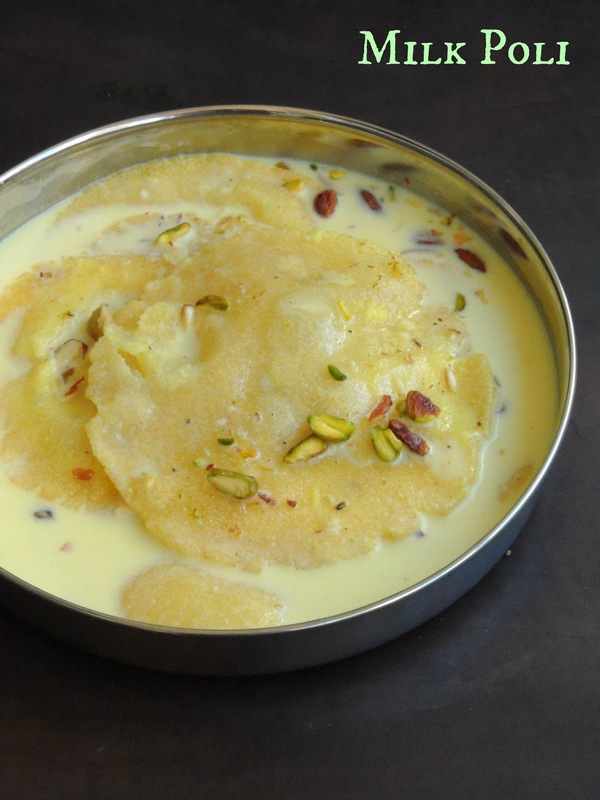 And this paal poli is my childhood favourite and now its my kids favourite. Though you can prepare this same Paal poli with maida or wheat flour puris or else with leftover pooris, the traditional puris calls for semolina aka rava puris soaked in nuts loaded saffron flavored masala milk. This sweet is my family special dish, this authentic sweet when served chilled makes an absolutely delicious dessert for a get together. However kids love this rich paal polis, you can prepare them earlier a day to relish this pooris dunkened in fantastic milk flavored with saffron strands and chopped nuts. My today's post is completely vegan, yes as much as like Indian cuisine, Greek cuisine provides an abundance of Vegan recipes and today's recipe is one among those. Greek cuisine is very well known for their vegetable patties, obviously one of them is this chickpeas patties which is similar to the famous falafel. Chickpeas is very much used in Greek cuisine and this beans is my favourite, obviously i looked for an easy breezy dish to cook with this incredible beans to serve along with rice. And this Revithosoutzoukakia caught my eyes as this dish calls for a lip smacking tomato sauce. Trust me, we thoroughly enjoyed this dish and the sauce served along with rice makes a complete meal. The chickpeas patties is prepared with cooked chickpeas along with fresh tomatoes, yes you heard it rite. 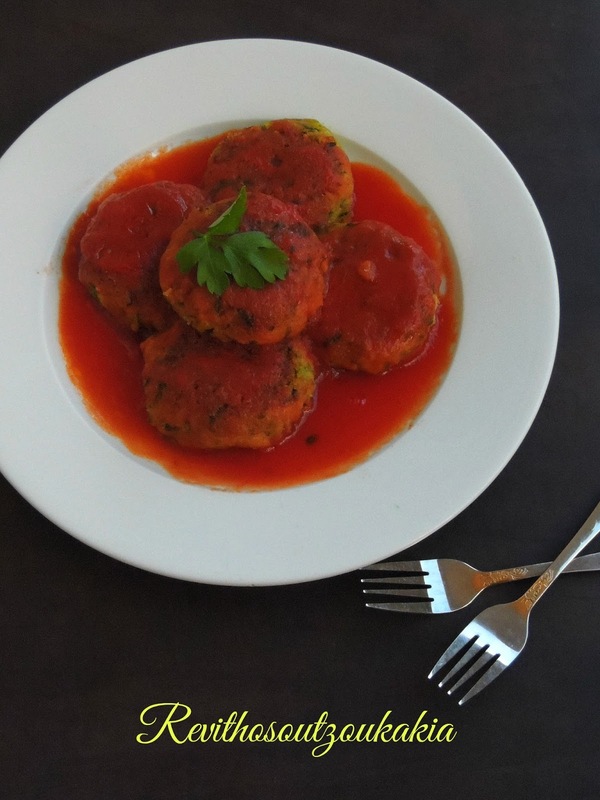 Tomato is used in making this patties which is later drenched in a red sauce prepared with tomato paste and olive oil. Shrove Monday or Clean Monday (Kathari Deftera) is a Greek public Holiday, usually celebrated by going out for a picnic and also by the custom of kite flying. As with most holidays in Greece, this one also revolves around food. As it is the first day of the Orthodox Lent, no meat, fish or dairy products are consumed. This means that it’s the day of the year to make all these traditional Greek recipes, like taramasalata, dolmades, semolina halva and of course the one thing that holds everything together is the traditional Lagana bread. 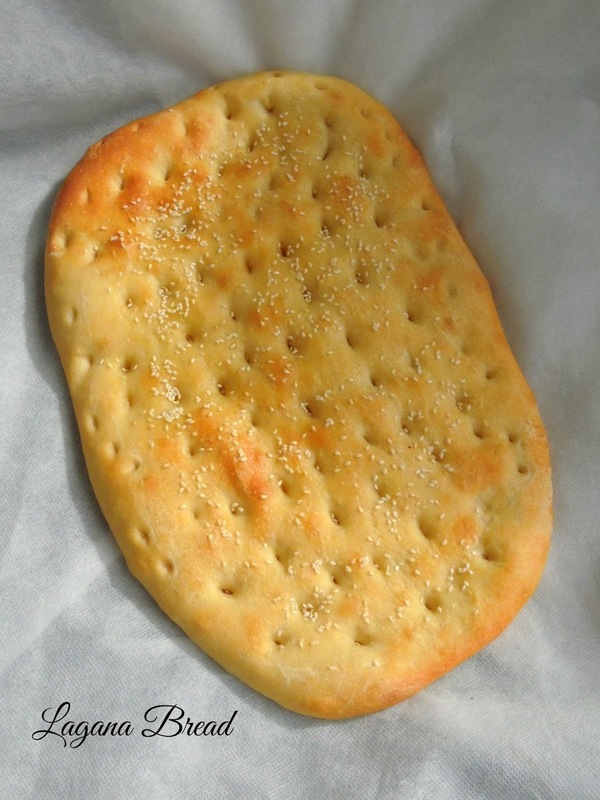 Lagana bread is a Greek flat bread which is quite similar to Focaccia and this bread is traditionally baked only on Shrove Monday, the first day of Great lent before Easter. Since the fasting calls for no dairy products, this bread is completely vegan. An authentic touch is given to this bread by pressing the dough with fingertips all along the surface of the Lagana, with sesame seeds which is most common topping of this bread. Last month was Mega marathon and from today onwards we, blogging marathoners are kick starting the usual three days of blogging marathon. 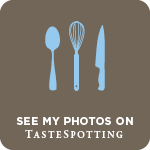 You might have noticed that i have been blogging for a whole month with many interesting and traditional dishes from various parts of the world. If you have missed them, dont worry, just check my recap of those delicious 26 baked treats here. And this week's blogging marathon is going to be all about Greek recipes. Yes this week's theme is 'Flavorsof Greece' and am gonna share three different delicious dishes from this incredible cuisine. 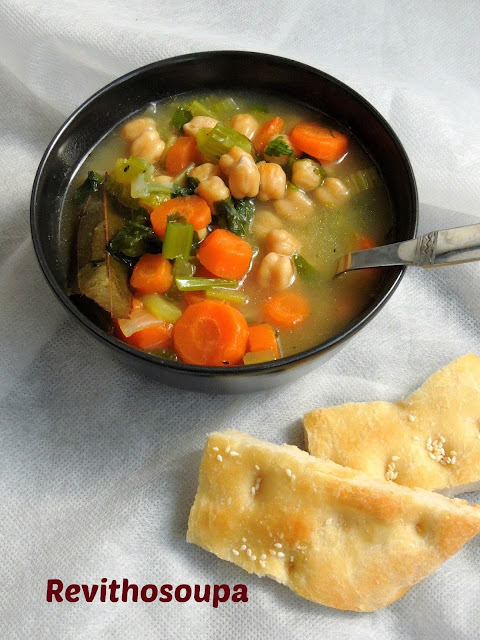 For the first day, am posting this Vegan, gluten free,nutritious and kid's friendly Greek chickpeas soup which calls for basic ingredients with handful of colourful vegetables and obviously cooked protein rich chickpeas. 26 days of A-Z Baking Around The World, this was the theme of April month's blogging marathon, obviously i couldnt resist to participate as baking is one of my passion. Baking is definitely my stress buster, my ovens will be busy during weekends as i will be baking very much. Finding out different recipes from around the world with alphabets was definitely a big challenge. Needless to say i prepared my list of baking around the world since three months as am able to bake only during weekends. Preparing a list of baking earlier never happened to me but when life is busy with other stuffs, pre-planning is a must. This time pre-planning worked awesome and i started scheduling my posts earlier as well. Obviously this month's mega marathon was completely no-stress and i had enough time to visit my fellow bloggers and the bookmarking list is overflowing now. However my fellow bloggers are doing an awesome job and i came to know more interesting dishes which are quite easy to bake with less efforts. Do you know you carry very well your salad in a jar, with a simple earlier plan, you can prepare your salad jar everyday easily to carry in your bag to enjoy for a lunch or else for a picnic. 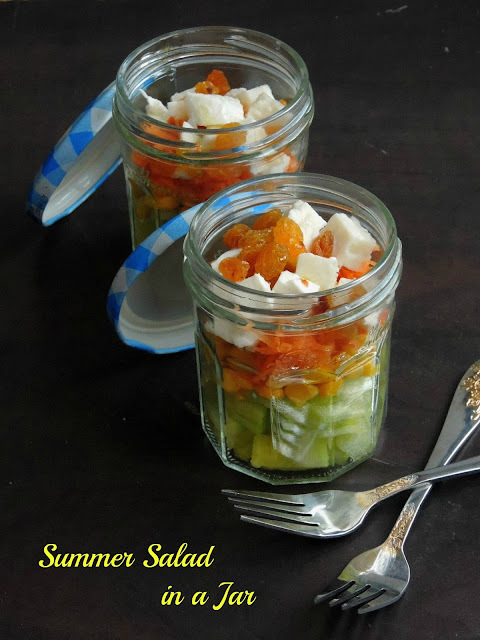 My today's post is a summer friendly salad which i simply prepared quickly with couple of vegetables, mozzarella cheese and golden raisins. Easy to prepare, this salad will definitely please you as most of the vegetables i used in this salad are completely healthy and raw. No oil is needed and no dressing is needed. Spiced up with salt and pepper powder, this salad is very quick to prepare.Actually am posting this salad for this month's Shhh Cooking Secretly event started by me, which is now hosted by Mayuri Patel.